When we get the opportunity, Adri and I like to spend Sunday morning drinking coffee, eating croissants and reading the paper. It’s a lovely way to start the day before we head off to church. Last Sunday however, I was frustrated by two articles in the Sun-Herald. (I’ve really gone off this paper – but that’s another story). The first was a piece on George Negus. The main story seemd to be something about his ideas to save the planet. I didn’t read that. What caught my eye was a small piece on his views on the “Intolerance of Religion”. He said that in his youth he was a lay preacher (didn’t say which church). However as he aged, and matured, he began asking more and more questions of the world. He then decided that it is arrogant and wrong to adhere to a religion that believes they are right and everyone else is wrong. He said he “grew up” and grew out of his faith. On the next page was the column by Peter FitzSimons. Now I don’t mind Peter, although I think some find him fairly abrasive. He is clearly a passionate man. Last week he had a go at Aaron Baddeley for talking about God at every opportunity. This week, after seven days solid of complaints, he told the Christians in his audience that there are many god’s out there, who are you to say yours is necessaarily any better than anyone else’s? therefore, I will ignore all of them. The problem with this position is this: by aiming to be tolerant, and by not telling anyone they are wrong, you end up being intolerant and telling EVERYONE they are wrong. It’s like saying “I am the only one intelligent enough to see the bigger picture and realise you can’t all be right – therefore I’m right and you are all wrong”. Can you see my frustration? I think it is very easy for someone to take potshots at Christianity from a simplistic, high-level point of view, but isn’t it ultimately arrogance to not engage with Christianity and just assume that you know better? I have been reading up a storm since I finished my exam. It’s nice to be able to read something because you want to read it rather then because you have to! I have already mentioned that i just finished The No. 1 Ladies’ Detective Agency by Alexander McCall Smith. Apparently they are making this into a TV show. I am keen to read some more of these. The Christian’s Great Interest by William Guthrie. William Guthrie was a 15th Century Puritan minister in Scotland. Someone at church lent me the book because they thought I might be interested. If his name is anything to go by, it’s bound to be a ripper! There are a couple of other books on my reading ‘wishlist’ at the moment too, so I will have to make the most of my time before the next exam! 1. For the Love of God by DA Carson – I’ve mentioned this one already. Adri and I are doing the daily devotional readings. ‘Tis tops. 2. 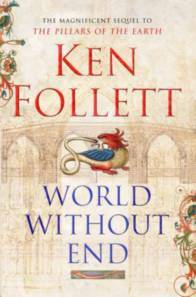 World Without End by Ken Follett – This is the sequel to the novel ‘Pillars of the Earth’. I really enjoyed Pillars, and so far I am really enjoying this. I think I like the historic context and the various characters story-lines that are interwoven. I also like how the story extends over many years. Although I sometimes feel like he dwells on one time period for too long and doesn’t give enough weight to others. Has anyone else read either of these? Would love to hear your thoughts. 3. 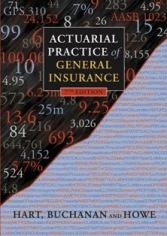 Actuarial Practice in General Insurance 7th Edition by Hart, Buchanan & Howe – Boring as anything, but it must be done. Actually some of it is not too bad. I have to read 10 chapters of this tomorrow, and make summaries.